Oh Sparkle, you are so cute! It looks like you can’t believe your eyes! Hey—Tommy says she saw that House Panther too–but, uh–it didn’t say much 🙂 I LOVE my Lady Sparkle book—and Tommy thinks your Human was so sweet and enjoyed all the time with everyone at the booksigning!! Now the dogs would go crazy for that. Great pictures. That’s a weird looking cat. Does it smell ans weird as it looks? OMC….we must live in the same house….our Mom got one of those (not at the Cat writers conference). We were equally amused. Hi Sparkles! That thing looks pretty frightning!!!!!!!!!!!!!!! You look bit horrified in the first photo, but hopefully it won’t give you too much trouble. You are gonna need a bigger litter box! We have the exact same questions as you do Sparkle! Love, love, love the expression on your face in that last photo! And is that “cat” still in residence? Probably more of a flat cat by now, eh? Sparkle you look like you’re okay with the new addition. Did your sisters feel the same way? Now that is the kind of cat we would all like around here! Oh, we are so glad that thing wasn’t the REAL version. Talk about some hissed off ladycats. It MUST make a nice toy on top of it! You want a black cat? Well, I gotch-yer black cat right here, and *I* has furz. You could POP this pathetic excuse for a feline with one paw tied behind your back. Wow that kitty is as big as you! At least it’s not a real one! That’s practically life sized. I noticed you appropriately smelled the tail first. You still look a bit spooked standing next to it. looks like they made peace in the end. We love how the first two photos are mirror images: the first one, your paw is lifted just like it’s paw is, and in the second one, you two look like you’re sniffing each others’ tails! Our human can’t stop talking about how great it was to see you this past weekend! We think thats awesome! black cats always need a good home! Eeek! You look shocked, Sparkle! Whew – you are really lucky it wasn’t a real one! There for a minute I was worried for you. At least it won’t steal your food Sparkle. Oh COOL! And it’s BLACK too! I applaud your hooman’s taste in fake felines! oh!!! Poke it! Poke it, Sparkle! That’ll make it go away! – Crepes. Whew! Bet that was a relief, huh? 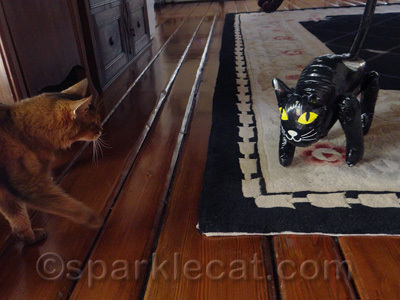 I know I felt relief when I found out the last cat my peep brought home was actually a garden statue. A new friend! Looks like that one won’t be giving you much trouble. And the cat who was full of hot air went *** P O P ***!! Doesn’t seem to have much to say for itself, does it. What a great looking cat and he is black too. Does he have a name?? Bet he doesn’t smell very much Sparkle. At least it doesn’t eat much. Take care. That is one freaky cat, Sparkle. And it looks like a couple of claws in it might do it in. He’s new pal.. 🙂 Cute! We absolutely LOVE your expression in the last photo! You tell her, Sparkle! Pop that fake cat with a claw. It doesn’t even smell right! 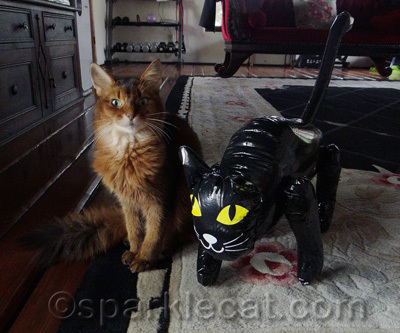 That is a goofy looking cat–it doesn’t even look remotely real. At least he won’t eat your food or toys! Well, at least that cat will not take your toys and eat your treats. That’s just wrong for them to bring in a cat like that without consulting you… clearly, they should have, since that cat is full of hot air! BOL! We are SO glad fer you that it is “stuffed”?